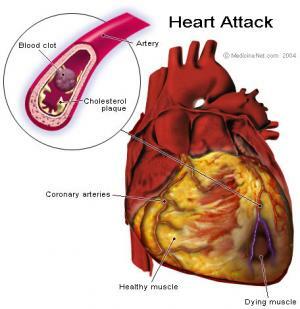 Myocardial infarction or heart attack is life-threatening condition and the treatment has to start on time. This means the very diagnosis has to be established immediately. Majority of doctors are aware of the symptoms and signs of heart attack and the patients are taken care of rather quickly. However even the prompt therapy sometimes is not efficient because the infection may affect large heart arteries and damage wide portions of heart muscle. After the diagnosis is set the treatment starts right away. Medications that are administered include antiplatelets, nitrates, beta blockers, calcium channel blockers, ACE inhibitors and so. Antiplatelets such as Aspirin are mainly used in prevention of myocardial infection. They reduce the chance of clot formation. Nitrates such as nitroglycerin are given to patient orally. He/ she places the tablet under the tongue as the absorption is greatest on this spot. In case there are no nitrates available ACE inhibitors may be equally helpful. These drugs like nytroglicerin prevent constriction of blood vessels therefore allow the heart to be supplied with more blood. Captopril, Monopril or other ACE inhibitor are efficient in vasodilatation. Another group of medications is significant in treatment of heart attack. These are called diuretics and their primary function is to eliminate the excess of fluid and salt from the body. Beta blockers lessen the heart's workload and this way prevent further damage. Calcium channel blockers are efficient in both prevention of Vasoconstriction and enhancement of blood flow through coronary arteries. Heparin is anticoagulant agent which if administered on time pay prevent lethal outcome. Even streptokinase can be used but at the very beginning of the infarction. Heparin is used in patients who undergo the surgical procedure called primary angioplasty. The patients suffering from heart attack have to be given oxygen. Other medical procedures in treating heart attack includes coronary angioplasty and coronary artery bypass graft. In the first procedure a catheter with a tiny balloon is inserted into the narrowed artery. The balloon is then inflated and deflated until the blood flow is improved. The procedure may be followed by stenting. Stenting means that a stent which is sort of stretchy tube is placed into the artery and stays there for ever. This procedure re-establishes normal blood flow. Coronary artery bypass graft means that ends of healthy blood vessels are grafted with the parts of blood vessels taken usually from chest or lower extremities. These grafts are placed above and below the damaged artery so the blood skips the narrowed artery still supplying the appropriate area with blood. This procedure is done in prevention and as a treatment of myocardial infarction.